Many REALTORS®, members of the National Association of REALTORS®, go beyond helping consumers buy and sell homes by giving back to their communities through volunteer work. In fact, according to NAR’s Community Aid and Real Estate report, nearly 70 percent of REALTORS® volunteer in their community each month. To recognize that commitment by REALTORS® across the country, NAR is currently accepting applications for the Good Neighbor Awards from REALTORS® who have made an extraordinary impact through volunteer service. Ten finalists will be announced in September and the public will have a chance to vote for their Web Choice Favorite. Judges will select five winners who will be announced in the November/December issue of REALTOR® Magazine and will receive a $10,000 grant for their nonprofit organizations. The winners will be recognized at the 2019 REALTORS®Conference & Expo in San Francisco, receive travel expenses to the conference, and also gain considerable national and local media exposure for their cause. In addition to the winners, five honorable mentions will each receive a $2,500 grant. 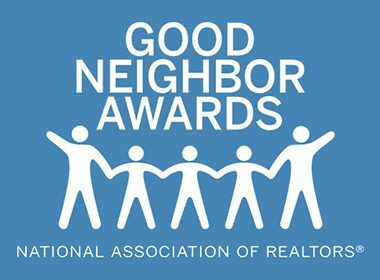 Since 2000, the Good Neighbor Awards has donated more than $1.2 million to REALTORS®-led nonprofits. The Good Neighbor Awards is supported by primary sponsor realtor.com and Wells Fargo Home Lending.